Android Phones cater several types of touch screen actions or gestures like double tap, swipe, long press, pinch, flinch etc. 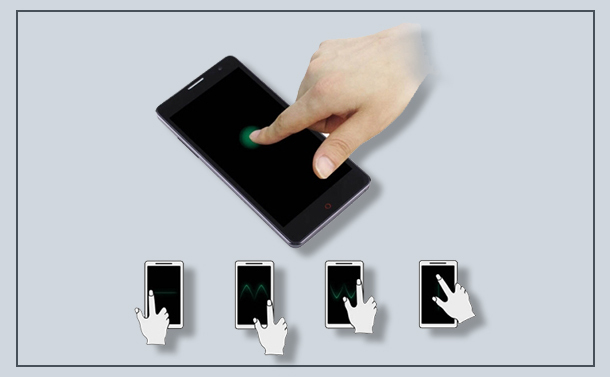 These Gestures helps enhance user-experience and makes the device more fun to use. As long as you know the right gestures, it can totally speed up the way you use your device. Unsurprisingly, Android Mobiles are packed with plenty of gesture controls to interact with your device, but most of them are unknown to most users. But do not worry as we will provide you with a detailed list of several Android gesture controls for you to learn. Double tapping & pinching in and out to zoom images is not too user friendly when you have only one finger free. To zoom in & out you have another gesture i.e. double tap on an image and don’t let go of the finger on second tap and just drag upwards and downwards to perform the action. Same gesture works in Google Maps also, it’s kinda handy feature when your hands aren’t free to perform a pinch. As by default, Google Maps has flyover view, which is pretty useful for normal navigation or driving. But once you get into densely populated area, this default view probably won’t help. To get a 3D view, you just need to to swipe up/down with two fingers on google maps. You possibly use Chrome a lot on your Android Mobile, and might have multiple tabs opened. With multiple tab option on top right corner, you switch to one tab from another. An easy way to do this more quickly and more stylishly is by swiping, like you do to your photos in gallery. You just have to go on the address bar and swipe left or right to switch between open tabs in Chrome. Let just say you have spread your heart out through text, but came into senses just before sending it. Deleting whole message by long pressing backspace button can take lots of time. Just by using a simple gesture you can delete whole of your text in just one go. Press the backspace button & immediately swipe to the left. It will highlight words & as soon as you lift your finger that select portion will be deleted instantly. Good Stuff! It often becomes a problem when you have to write a content with the combination of numbers, symbols and alphabets. Every Time you have to type numbers or symbols, you have to go on number/symbols button and then again back to alphabets. But with an amazing gesture google keyboard has for you is simply press hold the symbol key and drag it to the letter you want to a number or symbol in the number & symbol page. As the name suggests, it will help you out to zoom in/out to an extent, like a magnification feature. But to enable this gesture, you have to go into your Android Mobile Settings and choose Accessibility option, as it opens you have to find Magnification gesture and turn it on. As the toggle enables, this gesture will instantly start working. You have to triple tap anywhere- whether on home screen, website, photos, videos anywhere – it will automatically magnify. And you can explore each aspect at its proximity. Living in an environment, where you never know what perfect moment comes around. You just need a camera which app up and run as quickly as possible. For that you just need one gesture i.e. Double Tap Power Button & be ready for CLICK. Remember if you don’t have stock android, this feature won’t work on your device. With Quick Settings you have various toggles like WIFI, Location, Bluetooth, Brightness etc. To turn off your Bluetooth, you simply have to swipe down that first opens Notification Center & then repeat the action again to open quick settings where you will find Bluetooth with other toggles. Or you can do it more quickly by simply Swiping down with two fingers that will instantly open entire Quick Settings panel. Though it is not solving a major hassle, but the satisfaction quotient accompanied is quite neat. Gestures surely adds an intuitive experience for users. You should definitely try these cool gestures on your Android Smartphones. If you have some other gestures, that we missed out. Please add in the comment section below. What Could Possibly Go Wrong With Big Data?